Our creative and experienced team will come up with a dynamic and beautiful custom website that converts visitors into customers and helps you achieve your business goals. Only services that solve your real problems. When you partner with us, you’ll find we first work hard to understand your business and find out what problems actually need to be solved. Only then do we brainstorm which services you need. Importantly, you’ll never be offered services that don’t solve your problems and you’ll always be able to pick and choose what sounds best to you and fits your budget. We don’t just design, we build. Our development team helps integrate design with functionality for incredible performance and support. WordPress is supported by a thriving community. It is designed to be easy for a site owner to add content on a regular basis without any technical experience. Google tends to favor well-built WordPress sites because they structured well and updated more frequently. With smart content, a WordPress site tends to rank faster than a static website. We believe clear and concise communication is essential to the success of a project. You will be assigned a project leader who will keep you updated throughout the project. Our team is based in New Hampshire and all of our web design and development is done in-house, meaning we do not outsource any design and development. Unlike most digital agencies we don’t offer every service under the sun. For example, we don’t do apps, we don’t do information architecture etc. Instead, we specialize in helping businesses to get more customers using the web. This is what makes our clients money – it’s what actually matters – and as such, this is what we focus on and are best at. Some of our customers prefer to pay up front just for the Discovery Process. This allows them to get a scope before really committing to the final project. Then if they do move forward, that investment is directly applied to the project. A landing page is a standalone web page distinct from your main website that has been designed for a single focused objective. Many landing pages have a distinct objective to sell a product or service and may not have any global navigation to tie it to your primary website. 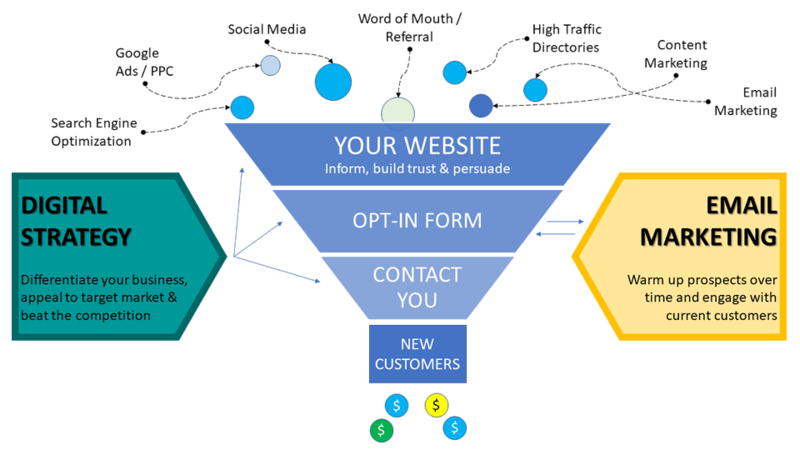 The main reason for this is to limit the options available to your visitors, helping to guide them toward your intended conversion goal. Another common use for a landing page is for a single page website. For example, many small business and churches do not have much content to share and may not need multiple pages. In cases like this, a one-page website may be all you need. The most common type of websites we build is small 10-20 page websites that act as an online brochure with some additional functionality such as calendars, custom forms, sliders, and blogs. It will serve to help brand and market your company, showcase your products and services and inspire sales as a lead generating tool. All our sites use the latest standards to allow your site to look the same on nearly every computer/device. These websites usually consist of many pages and custom functionality not found in the standard WordPress CMS. Many membership and real estate listing sites can be created within this price range depending upon the level of functionality and design. Although these sites do have custom design work, more expensive elements like Membership functions and restricted pages will affect pricing. Usually, we agree on a direction and we design it along the way based on our initial discussion. If you require a mockup to approve in advance, we charge $850 for a homepage mockup, then, $210 for the first inner page, and $84 per page after that. Each hour of revisions is $150 per hour. We will include these additional charges in the estimate if requested. We know that many non-profits and home-based businesses do not have the budget for a custom web design. So we have invested thousands of dollars and hundreds of hours on our pre-made WordPress templates so that you can still have a great website. Just select from one of our pre-made templates and choose from a variety of packages available to you from basic setup to entering in all your content and adding some additional customization. Our template packages range from $175 to $1,599 so you will be able to find something that works for you. Not all websites are created equal. They can vary greatly in cost depending on the level of design and functionality needed by your specific business. At TrueForm Marketing our hourly rate is $150. We also offer special discounts for partner companies, non-profits, and special circumstances. We know from experience that fixed-price contracts are rarely beneficial to you, as they often limit you to your earliest ideas. We don’t want to limit your ability to change your mind or add new requests. We will give you a general estimate based on our initial correspondence. Estimates are based on the number of hours that will be spent on your site’s design, development, maintenance, communication and any other overall costs associated with your project. It is important to have a good idea of the features that you would like for your site to include and where you will be obtaining your site’s content. If you don’t know where to begin don’t worry, we can walk you through the basics and help get you started on the path that is right for you. Let us know how we can help support your business by going to the Contact Us page. Usually just a quick phone call, Loom or Skype call, and we can determine if we are a good match for your project. We meet with you to define your requirements and layout the services that will be offered. Now that we have agreed on a project, we will schedule a time for the project team to get things kicked off, projects usually take 4-6 weeks. We will bill 50% at the time of signing the contract and the other 50% right before Go Live. Build out the site to your specifications from the Discovery meeting. We do a full test on all pages and check that the content displays properly on all media types. We will send you the final invoice and then once received we will move the development site to the live site!